Vitamin K2 can play a critical role in the treatment of osteoporosis. In this blog post, I will discuss Vitamin K2 and osteoporosis. I will also list the foods high in Vitamin K2, provide the current recommended Vitamin K2 dosage for osteoporosis, discuss Vitamin K2 deficiency, differences between Vitamin K1 and Vitamin K2, and tell you about a Vitamin K2 food source rock star. First, I prepared the article for my patients because many of them are confused by the mixed messages that they read on Vitamin K1 and K2 and its role in the treatment and prevention of osteoporosis. Second, I do not sell, promote, or have a financial interest in supplement products whether they be Vitamin K1, K2 or other dietary supplements. Third, as much as I could, I rely on published and peer-reviewed research as my source of information on Vitamin K. I avoided sources (such as postings by supplement manufacturers) where I sensed a conflict of interest present. With that out of the way, let’s get into the detail on the relationship between Vitamin K, osteoporosis and your bone health. There is a strong body of research demonstrating that Vitamin K2 is an effective way to treat osteoporosis and improve both bone density and bone strength. It is also good for your cardiovascular system. Vitamin K2 is more effective than Vitamin K1 for improving bone health. The main sources of Vitamin K2 are animal products and fermented foods. A Japanese fermented dish called Nattō is particularly abundant in Vitamin K2. Research has shown that Vitamin K2 supplementation in the form of MK-7 and MK-4 can help bone health. Unless you are actively increasing your Vitamin K2 levels through diet or supplementation, you are likely deficient and have inadequate levels for your bone and heart health needs. Vitamin K2 MK7 dosage recommendation is 150 to 180 µg per day. This is based on the dosage used in most recent research studies. Recommended daily dosage for Vitamin K2 MK4 is 45 mg.
You should exercise caution when taking Vitamin K2. This advice is particularly appropriate for people taking anticoagulants. Consult with your physician before starting a Vitamin K2 protocol. Activates the osteocalcin (a protein produced by osteoclasts) so that it can help calcium bind to your bones. Keeps the calcium (which is essential for maintenance of bone health) out of our blood vessels and targets it at our skeleton. Cancer Prevention. Several research projects indicate that Vitamin K2, in particular, can play a role in reducing the risk of several cancers, including prostate and liver cancers. Although both Vitamin K1 and K2 are fat-soluble vitamins, there are a number of important differences between Vitamin K1 and Vitamin K2. The topic of Vitamin K can be a little confusing and hard to understand. One source of confusion is that there are two major families of Vitamin K — a Vitamin K1 family and a Vitamin K2 family. First, Vitamin K1 is given its name because it is a single molecule called phylloquinone. 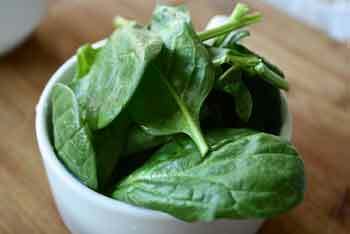 It is found mostly in plant foods such as leafy greens. Vitamin K1 is composed of a single member and participates in blood clotting. The Vitamin K2 family, on the other hand, is the bigger of the two and is divided into a number of subgroups which include MK-4, MK-7 and MK-9. Vitamin K2 is mostly found in animal foods and fermented foods (more on this in the next section of this post). Menaquinone (or Vitamin K2) is a group of essential fat-soluble vitamins. These compounds are labelled by their number. Only two of the group ever get meaningful attention and these are the MK-4 and the MK-7. Both are common supplements that I will cover, in some detail, in the section this blog post dedicated to Vitamin K2. I will cover food sources of Vitamin K by starting with Vitamin K1. In general, plants with dark leaf colour have substantially higher concentrations of phylloquinone compared to plants with lighter leaves (such as iceberg lettuce). In addition, spreads and salad dressings made from soybean, canola, cottonseed and olive are also excellent dietary sources of phylloquinone. Unlike Vitamin K1, that is found in plants, Vitamin K2 is principally synthesized by bacteria. Before I identify the foods high in Vitamin K2, we need to spend a bit of time on the two most popular forms of Vitamin K2, namely MK-4 and MK-7 and explore their food sources. Here is how MK-4 is produced by grass-fed animals (cows, pigs, chickens, for example): the animal consumes plant food containing Vitamin K1 and converts, in its gut, to the MK-4 form of Vitamin K2. It should be noted that, although humans can convert K1 to K2 in their gut, we are not near as efficient as grass-fed herbivores. If you prefer to get your Vitamin K2 from animal-based sources, then you will need to consume their product. It is unlikely that you will generate enough MK-4 in your gut flora to meet the needs of your bones. The half-life of MK-4 is substantially less than that of its family member, MK-7, and as a result will stay in your body a shorter time. The daily recommended dosage of MK-4 is 45 mg.
Because of its short duration, you will likely have to take three daily doses of MK-4. One dose is adequate for MK-7. The MK-4 you will find in dietary supplements is likely synthetic whereas the MK-4 found is food is produced naturally by nature. One of the side benefits of getting your Vitamin K2 through natural food sources, as opposed to dietary supplements, is that you will, at times, get several sub-groups of Vitamin K2 mixed into the food. That is not always the case because some foods only have one of the sub-groups. Here are some food examples to chew on. Curd cheese is another food with representation of most of the Vitamin K2 sub-groups; although the quantities are low in many of the sub-groups with the exception of MK-8 and MK-9. This is likely an indication of the importance of production from bacteria fermentation as compared to production by the grass-fed animal. Like curd cheese, Edam cheese is another food with representation of most of the Vitamin K2 sub-groups; although the quantities are low in many of the sub-groups with the exception of MK-8 and MK-9. This is likely an indication of the importance of production from bacteria fermentation as compared to production by the grass-fed animal. As I mentioned earlier in this blog post, MK-7 is derived from fermentation — but not all fermentation is the same! Some foods as simply far better than others when it comes to MK-7 and a number of fermented foods cannot be counted on to provide adequate levels of MK-7. The superstar in Vitamin K2 density and specifically, MK-7, is a Japanese fermented soy dish called Nattō. 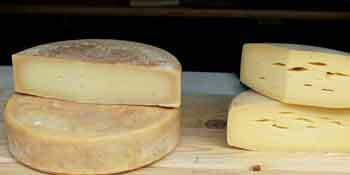 Fermented foods like cheese and yogurt. 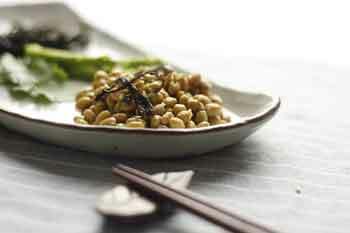 A Japanese fermented soybean dish called Nattō is a particularly generous source of Vitamin K2 as menaquinone-7 (MK-7). In fact, one could consider it a rock star in the world of Vitamin K2 sources! In her publication (4), Dr. Booth compares the content of Vitamin K2 from Nattō and two types of cheese. Nattō has almost 20 times the concentration of Vitamin K2 compared to hard cheeses and over 25 times the concentration found in soft cheeses. Nattō: 998 µg/100g of menaquinone-7 (MK-7). Hard Cheese: 51.1 µg/100g of menaquinone-9 (MK-9). Soft Cheese: 39.5 µg/100g of menaquinone-9 (MK-9). I have never tasted Nattō, however, it turns out Nattō is an “acquired taste”. The bad news is that most people will find Nattō has a disagreeable flavour. The good news is that you don’t need much to achieve your daily Vitamin K2 target because of its concentration. The only know one person who consumes Nattō on a regular basis. She eats it exclusively for its health benefits — not because of its taste! One more thing, it is important to note that when cheese is processed, such as in cheese slices, the Vitamin K2 is eliminated. Is MK-4 Better Thank MK-7 for Bone Health and Osteoporosis? A common question is whether you should use MK4 or MK7 for bone health and to treat osteoporosis. This article focused on MK7 more than MK4 because the most current research (for example, the three year 2013 Dutch study by Knapen, et al) was on the effects of MK7. There is research available on MK4, but it is more dated. MK4 and MK7 are menaquinones (Vitamin K2) and both appear to be beneficial to bone health. Both seem to do the job Vitamin K2 was designed to do, that is, act as an usher and direct calcium away from the arteries and assist in the binding of calcium to bone. I searched for a validated research report that compared MK4 to MK7 to see which was the better candidate for the prevention and treatment of osteoporosis but was not successful. In other words, researchers have more to learn about menaquinones so expect more information in the future. If you spend enough time, you will find sites that state MK4 is better than MK7 and other sites that argue the opposite. Some people preferred animal-based products; others fancy fermentation. Both sub-groups appear beneficial to bone health. The critical thing is get adequate levels of Vitamin K2 and some of the MK-7 sources, particularly Nattō, are hard to beat on that count. Does Vitamin K2 Help Bone Health? As I mentioned earlier in this post, Vitamin K2 is active in the metabolism of calcium by activating the calcium binding action of several proteins. A number of studies show that Vitamin K2 does help bone health. A three year study from the Netherlands (6) looked into the effect of Vitamin K2 supplementation — in the form of low dosage of Mk7 (180 μg MK-7/day capsules) — and it’s affect on the bone mineral density (BMD) and bone mineral content (BMC) of the lumbar spine, total hip and femoral neck. The research team also measured bone strength at the femoral neck. The findings showed that Vitamin K2 intake significantly decreased age-related decline of both BMC and BMD in areas with the most trabecular bone: the spine and the femoral neck. It also showed an improvement in bone strength in the femoral neck and a decreased loss of height in the lower thoracic vertebra. Vitamin K1 vs Vitamin K2 for Osteoporosis? Both Vitamin K1 and Vitamin K2 have been shown to play a role in improving bone health. Vitamin K1 is processed in the liver and plays a larger role in the coagulation of our blood. Vitamin K2, on the other hand, is processed in the intestine. This makes it more available to different tissues than Vitamin K1. Vertebral compression fractures (approximately 60%). As mentioned before, it has been shown that Vitamin K2 is also beneficial for your cardiovascular system. Is Vitamin K2 an Effective Osteoporosis Treatment? These rigorous scientific studies confirm that Vitamin K2 is an effective way to treat osteoporosis and should be part of your health regimen. Let’s tackle what could cause Vitamin K2 deficiency. Vitamin K2 deficiency tests are hard to come by. However, you can probably assume that you are Vitamin K2 deficient unless you are actively increasing your levels through food or supplementation. Some health professionals estimate that 80% of the US population has only 10% of their required Vitamin K2 levels. Poor nutrition. Not consuming adequate levels of either food from grass-fed animals or specific fermented foods. Antibiotics that negatively affect our gut microbiome. Poor absorption of Vitamin K2 from the gut due to aging or chronic gastrointestinal (GI) infections. Age-related compromised bioavailability of Vitamin K2. Studies found that when people take lots of calcium, the calcium coated their arteries and caused potential heart problems. Researchers have since determined that Vitamin K2 reduces the calcium level in the bloodstream (thereby reducing the risk of coating the arteries) and redirects it to the skeleton for bone building (by activating the osteocalcin protein). Most of the studies to date have been on rats. Studies on humans have been of a small scale. According to the authors: “Human evidence for the role of 1,25(OH)D in stimulating vitamin K-dependent proteins is scarce”. However, the researchers identified studies in Japan and Norway where a low 25(OH)D and vitamin K1 levels were associated with Bone Mineral Density (BMD), hip fractures and hop fracture risk. Should You Take Vitamin D3 with K2? Vitamin D3 and K2 are fat-soluble vitamins and compete for uptake if taken together. Later in this blog I get into some detail about the nature of this competition and identify the research (10) that supports these findings. Health professionals recommend that you take these fat-soluble vitamins three hours apart to reduce the competitive interaction between them and improve the absorption of the individual vitamins. A few words of caution before you integrate Vitamin K2 into your diet. There are several situations where Vitamin K2 could cause you health problems. Let’s start with soy allergies and then discuss blood thinners (anticoagulants). Menaquinone-7 (MK-7) is derived from fermented soy. If you have a soy allergy, Vitamin K2 in menaquinone-7 could be problematic. The other word of caution is for individuals who are on anticoagulants or blood thinners such as warfarin (Coumadin). Both Vitamin K1 and K2 support blood clotting and might counteract the effects of an anticoagulants. If you are on or plan to take an anticoagulant, you should speak with your physician about adding the recommended Vitamin K2 dosage for osteoporosis. For example, one of our readers shared her story about working with her doctor to optimize her level of MK-7 so that did not interfere with the medication she was on for blood clotting. How Should You Take Vitamin K? The absorption of the whole family of Vitamin K is greatly increased when you consume it with a meal rich in fats. This point is important and can greatly increase the absorption. Another important point is discussed below. Vitamin K is one of four fat soluble vitamins. The other fat soluble vitamins are A, D and E. Fat soluble vitamins are not absorbed from the stomach walls. The absorption takes place in the intestines. A 2015 study (10) looked at absorption in mice to see whether consuming more than one fat soluble vitamin at a time increased or decrease the absorption of the others. The study showed “significant competitive interactions for uptake” between Vitamin D, E, A and K. It seems that the only fat soluble vitamin that did not lose out was Vitamin A when taken with vitamin E.
The recommendation on Consumer Lab is that if you want to benefit from maximum absorption on your Vitamin K that you take it at least 3 hours apart from other fat soluble Vitamins (D, E and A). To learn more about this listen to my interview with ConsumerLab’s CEO, Dr. Tod Cooperman on Calcium Supplements for Osteoporosis. The Vitamin K2 dosage recommendations differ for MK7 and MK4 — the two most common Vitamin K2 subgroups. The 2013 study in the Netherlands discussed above (6) used a dosage of 0.18 mg/day (180 µg/day) of Vitamin K2 Mk7 supplements. In his book, Vitamin K2: The Missing Nutrient for Heart and Bone Health, Dr. Dennis Goodman, a cardiologist in New York City, also recommends between 150 to 180 µg/day of MK-7 Vitamin K2 (12). If you are not getting that level in your diet, you might consider supplementing. However, you should be cautious about the type of Vitamin K2 you take. Discuss your needs with your physician and take into account your health status and medical history. Nattō: 18 grams or 0.63 ounces. Hard Cheese: 352 grams or 12.4 ounces. Soft Cheese: 456 grams or 16 ounces. Please note that I am not advocating you eat that quantity of cheese everyday. I know I couldn’t eat that much! If you can get your hands on Nattō, you will be in a good position to have adequate levels of Vitamin K2. Consider supplementing the Nattō with a Vitamin K2 efficient cheese like gouda or cheese curds. Recommended daily dosage for Vitamin K2 MK4 is 45 mg. Because Vitamin K2 MK4 has a shorter half life than MK7, health professionals recommend that you consume Vitamin K2 MK three times throughout the day. One of the challenges with Vitamin K2 supplements is the efficacy of the claims on the package label. A 2018 study (11) looked at MK-7 supplements for content and impurities in both oil and no-oil dietary supplements. This study used MK-7 from Swiss, British and Polish producers. The researchers found many of the hard tablet dietary supplements had concentrations of MK-7 below the level listed on the bottle. In the case of the oil capsule supplements, the MK-7 vitamin content was significantly higher than listed. A number of dietary supplement providers prefer MK-4 supplements over MK-7. This is because they can produce MK-4 using a synthetic production while MK-7 requires fermentation. Also keep in mind that the dietary supplement may only contain the single sub-group and, unlike food sources, not have other related Vitamin K2 sub-groups. ConsumerLab, an independent testing organization, tested eight K2 supplements for purity, accuracy in labelled amount and absorbency. In their report, they identified two products that offered 100 µg dosage of Vitamin K2/Mk-7 in isolation. They also identified several “combination” supplement products where Vitamin K2 was one of the ingredients. To learn more about their report, visit ConsumerLab. If you are interested in learning more about Vitamin K2 and its affect on your heart and bone health, I recommend you read Vitamin K2: The Missing Nutrient for Heart and Bone Health (12) by Dr. Dennis Goodman. You can find the book on Amazon. In his book, Dr. Goodman presents the latest and most impressive research studies, as well as insights on diet, exercise, and stress reduction, as a conversation between doctor and patient. Another good read available on Amazon is Vitamin K2 and the Calcium Paradox by Canadian Naturopathic Doctor Kate Rheaume-Bleue. Your osteoporosis health regimen should include an appropriate osteoporosis exercise program and the right nutritional combination. Vitamin K1 and K2 play an important role in your nutrition and should be part of your regular diet. Presse N, et al., Low vitamin K intakes in community-dwelling elders at an early stage of Alzheimer’s disease., J Am Diet Assoc. 2008 Dec;108(12):2095-9. doi: 10.1016/j.jada.2008.09.013. Booth, S. Vitamin K: food composition and dietary intakes., Food Nutrition Research. 2012; 56: 10.3402/fnr.v56i0.5505. Knapen M.H.J, et al. Three-year low-dose menaquinone-7 supplementation helps decrease bone loss in healthy postmenopausal women. Osteoporos Int. 2013 Sep;24(9):2499-507. Cockayne S, Adamson J, Lanham-New S et al. Vitamin K and the prevention of fractures: systematic review and meta-analysis of randomized controlled trials. Arch Intern Med 2006;166:1256–61. Goncalves A, et al. Fat-soluble vitamin intestinal absorption: absorption sites in the intestine and interactions for absorption. Food Chem. 2015 Apr 1;172:155-60. doi: 10.1016/j.foodchem.2014.09.021. Epub 2014 Sep 16. Vitamin K2: The Missing Nutrient for Heart and Bone Health, Dr. Dennis Goodman. Hi Margaret – thanks for this. Indeed I was recommended by a naturopath about a year ago to begin K2 supplements for bone. However in the local pharmacy, all of the K2 supplements I can find are in the form of K2+D3. And in your previous interview, it is specifically stated that if you take K2 and D vitamins together, that D will cause K2 to be less effective. Should we be looking for K2 on its own? If so, where? How much calcium in supplements is safe to take for osteoporosis without damaging our heart? Thank you. Thank you for your helpful information for osteoporosis. It has made me feel better since diagnosed 2 years ago. Thank you. Thank you for your continuing guidance for us with osteoporosis. You are much appreciated!! I am on a blood thinner, Coumadin, and got the OK from my cardiologist and the clinic monitored my INR test closely for a few weeks until my K2 dose and INR tests were steady by adjusting my Coumadin dose. I take 45 mcg of K2 (MK7) for osteoporosis. You don’t want a bleed-out on coumadin. I knew someone who was on a different anticoagulant, rivaroxaban, for deep vein thrombosis. They were able to continue with vitamin K2 because rivaroxaban and coumadin follow different anti-coagulation pathways. Incidentally, I’ve increased my bone density in my lumbar spine between age 47 an 53. For example one lumbar vertabrae went from -2.2 to -0.6. I credit barbells and vitamin k2 with D3 for these changes. Hi Lynann, I have been successful at finding K2 in the form of MK7 at Ottawa’s local health food stores. My understanding about taking K2 and D together is that D crowds out the K2 and so to ensure maximum absorption it is best to take them at different meal times preferably with fatty foods (to stimulate bile production). If you do not find anything in your smaller city there is a good online supplement shop that I like out of Victoria: http://www.canadianvitaminshop.com If you’re like me and get frustrated searching through their web site, call them. They are very helpful. Hi Ms. Whitney, It is my pleasure to share this information with individuals like yourself concerned about building stronger bones. Hi Donna, Thank you for sharing your story about your wonderful doctor/clinic staff working with you to determine your optimal K2 dosage that did not interfere with your international normalized ratio (INR) levels. It is good to know that under proper guidance you can still take K2 while being on a blood thinner. Hi Barb, It is worth reading Denise’s story below on how she successfully was able to take K2. You must be thrilled and you should be so proud of yourself for improving your BMD scores. Well done. Hi Sandi, All the specialist are encouraging patients to get their calcium from their food. It is not so much an issue of how much calcium but rather ensuring that you have enough Vitamin D to absorb the calcium that you do ingest and secondly that your K2 level is also optimized to keep the calcium out of your arteries. If you do take a supplement remember that your body can only absorb a maximum of 500 mg in one sitting. This means that if you take a 500 mg tablet of calcium it would be best not to have a dietary source at the same time. Many of my clients were taking their calcium at breakfast when they already had milk as a source. This was too much calcium at one time. As a renal dietitian and someone invested in bone health, I’m thrilled to read your article on Vitamin K2. I speak to friends/colleagues at length about the promises of K2 — and no, it is not the same of K1!! It’s only a matter of time until this vitamin shares the same degree of celebrity as vitamin D has in recent years. Thanks for your service to the osteo community. I’m curious, I take my supplements in the morning including the K2 (MK-7) as my doctor suggested. Is there any suggestions as to the best time to take K2? Does drinking coffee or caffeine affect its effectiveness? I’m finding your site very helpful as I understand osteoporosis and what I can’t do to insure a long, healthy life! Hi Megan, Thank you for your support. After posting we were made aware of some errors in the sources of K2. We are working on correcting our error and will repost by December 2nd. Hi Patricia, I cannot comment on the product. It is good that you are taking K2 but according to many much wiser than myself I am told it is not necessary to take them at exactly the same time. Hi Angie, Like Vitamin D, K2 is fat soluble and so you will benefit the most by taking your supplement along with a fat rich meal. Egg yolks, cold pressed olive oils, avocado, and nuts are a few of the many wonderful sources of fats. I have not read anything about caffeine or coffee affecting its effectiveness. I am glad my web site is helping you to understand osteoporosis and life well despite the diagnosis. Thanks for this great article on Vitamins K1and K2. Very informative and made me more conscious of my intake of the great foods that contain them. With some heart disease in my family,I do not take calcium supplements but rather get it from my diet. Interesting article, but how could anyone eat 12 oz. of hard cheese or 16 oz. of soft cheese in ONE DAY? I had to read that several times! That’s kind of ridiculous. It is a whopping load of cheese! We did the math to illustrate to the reader how much they would need to consume to hit the daily target of 180 micrograms of Vitamin K2. We certainly do not advocate people consume that quantity of cheese on a daily basis. Natto is a much more “efficient” food source compared to hard or soft cheese. We discuss natto extensively in the article. The article points out that the Dutch study successfully used K2/MK7 supplements and the ConsumerLab report identifies two standalone MK7 supplements that pass their grade. A good quality supplement is likely the better path to Vitamin K2. First thank you so much for all the helpful information & research you share. A question re: your research Margaret: I had thought vit K2 in the form of MK4 is helpful for the bones, but your article is focused on MK7. Have you read anything further as to whether its helpful to take them both, or better to just use MK 7? Also, re ConsumerLab, an independent testing organization and their vit K reports, just a suggestion that people also research them before paying for access to their information. There seems to be a lot of questionable stuff out there about them though I haven’t looked into it enough to have an informed opinion. It is so hard to know which brands of supplements have the potencies listed on the bottles. I take the various Ks (and have severe osteoporosis) and would love to really know what is worthwhile/best, but it’s difficult to get accurate information and I was a bit discouraged reading some things on-line about consumerlab. Thank you for your kind comments. Before I answer any questions, let me first state that we prepared the article for our patients because many of them are confused by the mixed messages that they read on Vitamin K1 and K2. Second, we have no financial interest in the supplement, K1, K2 or vitamin business. We do not sell these products, do not receive a commission on the sale, or have a relationship with any manufacturer or provider. Third, we decided to rely exclusively on published and vetted research as our information source and not other people’s (including supplement manufacturers) interpretations of information. Let’s start with your first question regarding whether you should use MK4 or MK7 for bone health and to treat osteoporosis. Our article focused on MK7 more than MK4 because it appeared to us that the most current research (the three year 2013 Dutch study by Knapen, et al) was on the effects of MK7. There is research available on MK4 but it is more dated. MK4 and MK7 are menaquinones (Vitamin K2) and both appear to be beneficial to bone health. We searched for a validated research report that compared MK4 to MK7 to see which was the better candidate for the prevention and treatment of osteoporosis but we were not successful. If someone can locate one, please let us know! In her published study, Vitamin K: food composition and dietary intakes, Dr. Sarah Booth of Tufts University states: “The menaquinones are poorly understood in terms of vitamin K absorption and utilization.” In other words, researchers have more to learn about menaquinones so expect more information in the future. There are a number of differences between MK4 and MK7, most notably: 1) MK4 is plant-derived while MK7 is a product of bacterial fermentation of soy; 2) supplement-based MK7 appears to have a longer half-life than MK4; 3) the recommended daily dosage for MK4 is 45mg while the daily dosage of MK7 is 180 micrograms; 4) MK7 is identified as a “long chain carbon tail”. That is a strong claim and I have two concerns with it. First, the website taking this position sells MK4 supplements and not MK7, so they have a vested interest in promoting this position. “Whether menaquinone-4 is more effective as an anti-osteoporotic agent than phytonadione (Vitamin K1) remains to be established, but both forms can be used for carboxylation (of osteocalcin). The reduction in fracture incidence is particularly striking, with an approximate 80% reduction in hip fractures. Our findings should be treated cautiously, however, because the studies were not primarily designed to show a fracture effect. Another reason for caution is that the effect on fractures is much larger than with other treatments, such as bisphosphonates. I am not sure how you interpret the statements by the research team, but that does not sound “overwhelming” to me! First of all, in their report Cocknayne et al state “Whether menaquinone-4 is more effective as an anti-osteoporotic agent than phytonadione (Vitamin K1) remains to be established.” Then how can the MK4 manufacturer use this research report to claim: “For reducing fractures, the research overwhelming supports the MK4 form of vitamin K2”? Further, Cocknayne et al identify that the all of the research was done in Japan where “there may be dietary differences that could mean that these findings are not applicable elsewhere.” Were the study participants eating natto? In the end, I think you need to decide for yourself. Both seem beneficial to bone health but it is not clear, from the available research, if one is “better” than the other. I have noticed that people who advocate fermented foods align with the MK7 solution. The manufacturer who sells MK4 supplements only, prefers MK4. We tried our best to present what was available. I anticipate more research in this area with the result that more questions will be answered about menaquinones and bone health. In your second question you indicated some concerns with ConsumerLab. I am not familiar with the “questionable stuff out there” you refer to. I am sure if you devote enough time on the internet to any topic, you’ll find radically different, strongly formulated, and firmly held opinions. That is the world we live in today. All I can share with you is our experience with ConsumerLab. First, we have no commercial or financial relationship with ConsumerLab. We receive no compensation from them if you purchase a subscription. Second, we have a subscription that we pay out of our pocket. We use it to research the supplements we consume in the Martin household. Neither the FDA or Health Canada test supplements so we had to turn to an independent third party. We are happy with what we see in ConsumerLab. We found Dr. Cooperman very knowledgeable, professional and a pleasure to deal with. I think that the article is a testament to ConsumerLab’s credibility. Hope that helps. I’m sure you can decide for yourself. Thank you so much for taking the time and energy to reply so thoroughly. I really appreciate all the information. Right now I’ve been taking both forms (as well as K1, which I need for other reasons) and I will be also continue with my own research. If I find anything interesting I will certainly pass it on to you. I was aware of the apparently longer half life of MK7, which is why I added it in but it’s not ideal for me to be consuming a soy product daily. I agree that one can always find different and firmly held opinions on-line on jsut about any subject! By the way, I’ve been following your beginnign osteoporosis exercise program using your book and website resources (thank-you!). I will eventually be booking a phone consult with you as I have some questions in relation to my specific situation. However I’ve been in the midst of some other medical treatment so will wait until I’m through with that. Hi Shelley: MK-4 is derived from grass-fed animal sources. That will probably not work for you. The MK-7 sub-group is derived through fermentation of certain (but not all) bacteria. Not sure where you draw your vegan line as to what is consumable or not but those are the natural sources you get to choose from. Good luck.